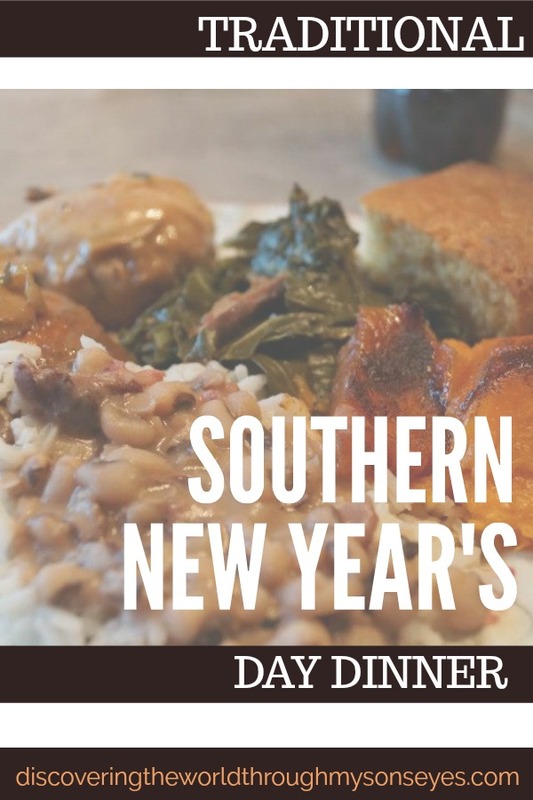 We’re kicking off the new year in true Southern style! My mother-in-law has graciously cooked for us a New Years Day dinner. 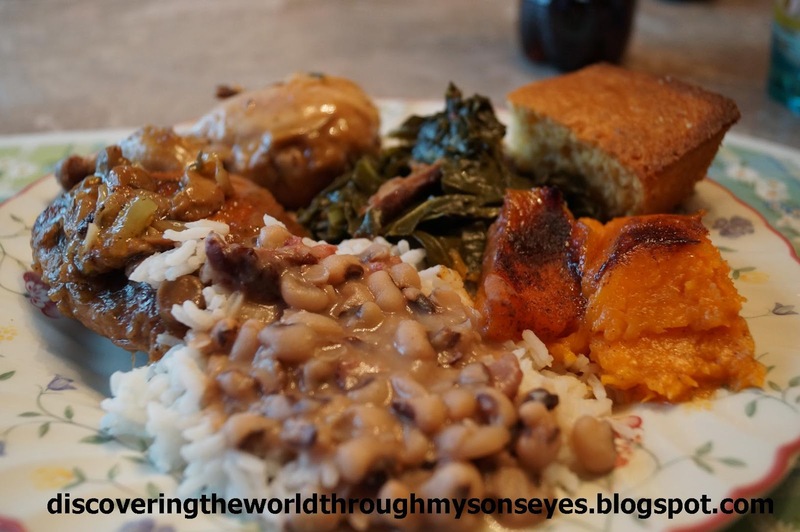 The menu was white rice, black-eyed peas, sweet potato casserole, chitterlings (pig intestines), collard greens, baked chicken (normally this would not be included in the new years day dinner,but since little one and I don’t eat “chit’lins” mother-in-law made it for us), and corn bread. For dessert she made a yummy apple dumplings. This is not just your ordinary everyday dinner, this is the dinner to have on new years day. For southerners black-eyed peas represents good luck, and increases prosperity in the new year, and the collard greens represents green dollar bills. The corn bread represents gold, and the pork represents progress. How interesting! I made sure we had plenty of those served on our plate! 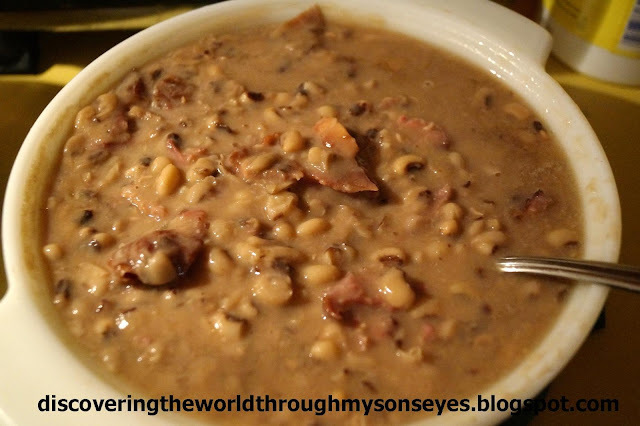 When I served little one’s plate and saw the black-eyed peas he said, “Yumm, I love black-eyed peas!” 🙂 Good! He’ll have lots of good luck and prosperity. My mother-in-law shared stories of when she was growing up how her dad would buy the hog jowls (whole hog head) to cook and they would get plenty of good meat from it. They would use that meat to cook with the collard greens and black-eyed peas. It was a feast indeed! Collard greens with ham hocks. Little one clowning around and enjoying new years dinner with Grandpa. Our new years day dinner was delicious, tasty (my mother-in-law can cook) and full of stories. I must say I was quite impressed on this new tradition. In Puerto Rico we really don’t have a “new years day dinner” since we just go all out on new year’s eve. This is a new tradition to be included in our multicultural familia, and one that we’re bound to enjoy for years to come! I’m hoping that after this delicious new years day dinner we should have lots of good luck, prosperity, progress and money in this coming year! Would love to hear if you have any traditions celebrating the new year? Please comment, share or like! 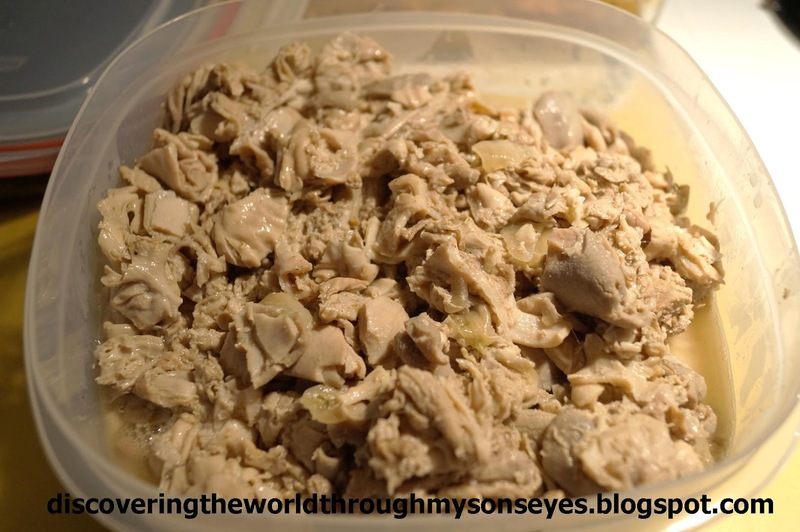 This looks wonderful but I think I would have also gone for the chicken over the chitterlings. So interesting to read what each dish represents. 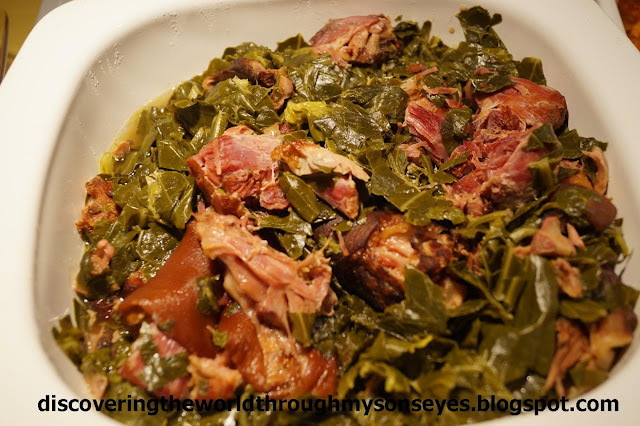 Those collards with ham hocks look delicious! I hear you! 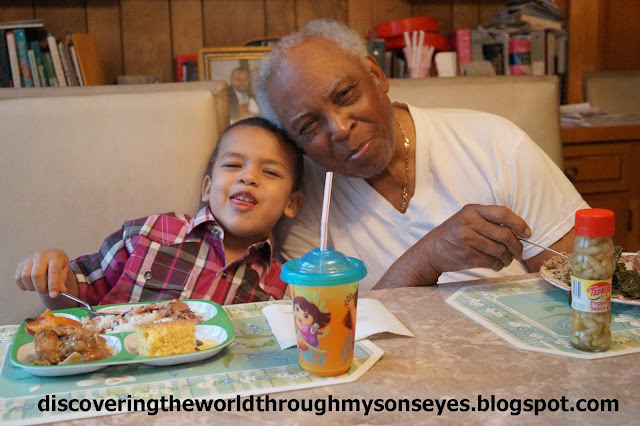 I had my MIL explain to me the meaning of each one… I was so clueless! 🙂 Thanks for stopping by!